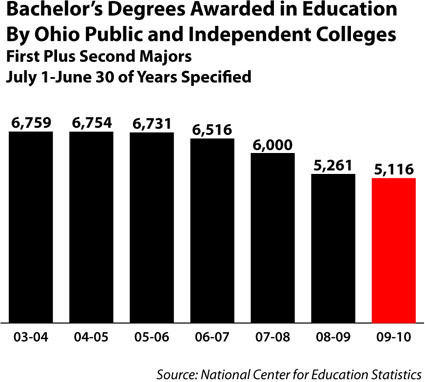 AICUO - The Blog: More Bachelor's Degrees, But In What Fields? More Bachelor's Degrees, But In What Fields? In order to keep the Graph of the Week published today clear and legible, we left several of the trend lines unplotted. By drilling into the data, gathered as part of the annual Integrated Postsecondary Education Data System, we found interesting, even troubling, details. 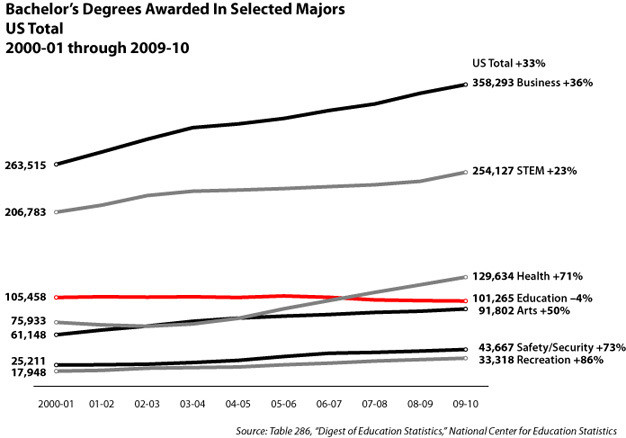 One worrisome trend is that the ten-year rate of increase in the number of degrees in science, technology, engineering, and mathematics -- the so-called STEM fields -- has not kept up with the overall increase in degrees awarded. 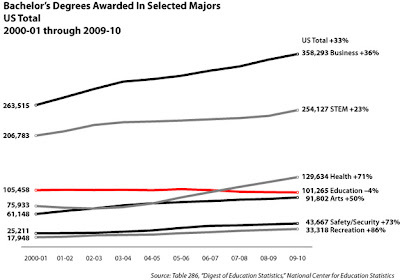 In computer science, one of the subcategories, the number of bachelor’s degrees awarded actually fell by one tenth, 44,142 to 39,589. The increase in bachelor’s degrees in health was largely driven by the nearly doubling of bachelor’s degrees in nursing: from 37,829 to 78,260 in all sectors. The B.S.N. is increasingly becoming the key to advancement for registered nurses, and some in the nursing community believe it should be required for entry into the field. 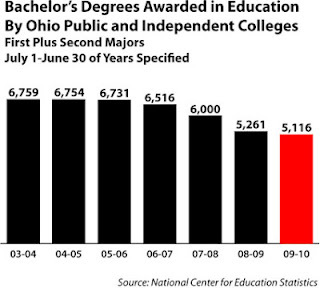 In February 2011 we documented the fall-off, amid the calls for more and better qualified teachers, in bachelor’s degrees in education in Ohio: nearly 25 percent in four years. Whether this is the marketplace of students responding to the criticisms of teachers and teacher education or to demographic shifts in the state’s population leaving fewer employment opportunities for new teachers we don’t know. The 50 percent increase in degrees in the arts comes from two subfields that approximately doubled the number of degrees awarded over the ten-year period: design and applied art, and film/video and photographic arts. Finally, we note that while STEM and education degrees are not keeping up with the overall trend in degree growth -- and business majors are just barely above the trend -- impressive growth lines come from a field whose interest is frequently attributed to popular culture, homeland security (the “CSI” effect), and from an area that is directed toward people’s time off: recreation, fitness, and leisure studies.